Nabarangpur-Online: 3-day Mondei fest Concluded at Nabarangpur. The three-day long Mondei festival concluded with the usual fanfare on Wednesday. 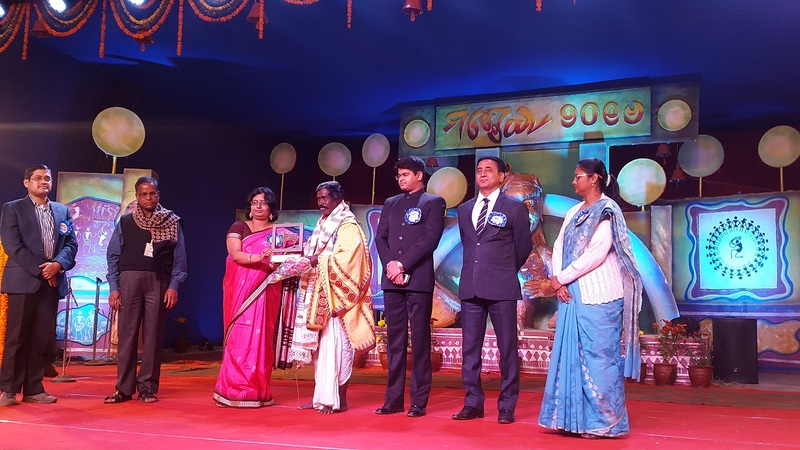 The cultural evening began after the ceremonial lamp was lit by Padma Shree Haladhara Nag, Superintendent of police Sudhansu Sekhar Mishra, DFO Swyam Malik, Commandant SSB V K Kasna, in presence of Collector Rashmita Panda, PDDRDA Poma Tudu. Dozens of cultural and dance troupes displayed their talent and skill. But the local tribal troupes ruled the stage. Tribal dances like Dhemsa, Ghumura, Dhab and Sambalpuri in their traditional attire was an attraction of the conclusive evening. Animal mask dance, Lambodi of Maharastra, Bajasal, Mangala Ghat, Odissi, were also performed. Local Trishakti organisation staged drama on Swach bharat. Padma Sree Haladhar Nag, along with local talents Jemamani Bossoiy, Sanjukta Panda,Banya Kabiraj, and three others were felicitated with Mondei sanmana for their contributions to different segments.